I need 7 in each module. Really upset with that. I wanna improve my writing score as I need 7. Please help me as I'm taking the exam on 12th. You really need someone to look at your writing to find out where you are going wrong. If you only took the test once it could be just that you misunderstood the question slightly - this is a reason for many scores being reduced. So you may be ok next time. Of course there could have been some grammar issues. This site can help you with understanding the question, organization etc, but grammar is more difficult to deal with online. You really need a teacher to help with this. So now what i have to do?? How can I go from a 4.5 to a 6.5? Comments for How can I go from a 4.5 to a 6.5? If you are currently at IELTS band 4.5, getting to a 6.5 is a very big task. At the moment you are getting 4s and 5s and you want to get 6s and 7s. The difference between a 4 and a 7 is huge. For example, a band 4 in writing will mean some of it is very difficult to read, whereas a band 7 is making very few grammar mistakes. So to be honest you have to be realistic and know that it could take you quite a lot of time if 4.5 really represents your current level of English. That said, I don't know why you have got 4.5. Did you practice much? Do you know the tips and strategies of the test? If you are actually better than 4.5 but you just made some mistakes then you may be able to do it quicker. So it is quite difficult to assess your position without knowing your circumstances. Anyway, you need to make sure you understand the basics of how to structure a good essay and task 1, so I would suggest looking at the model answers. Also, work your way through the IELTS lessons on the site. Everything is there to help you improve. Frustrated with IELTS - What should I do? This was my 8th attempt to try and get each band 7. My writing score has always been 6.5 except on the 7th attempt when I got 7(s6.5). I was very confident this time around. I have no idea what went wrong and what to do next. I still remember my essay word by word and infact, my IELTS teacher had told me that I might even get 7.5 for that essay. I am really frustrated and tired of IELTS. Please Someone suggest me what I should do? Comments for Frustrated with IELTS - What should I do? I will suggest to give PTE exam. Its more easy to score in PTE exam than IELTS. You need to tackle writing based on what you are graded on, and give the examiner what he/she wants. Check out the resources on ielts.allearsenglish.com. Nevertheless, effects of this trend have not all been beneficial. Most often, easy availability of branded products in developing countries may lead to juvenile crimes. For example, Apple I phones, one of the most popular and expensive electronic gadget in modern era, are commonly available in all parts of the world and it is an undeniable fact that younger generation are obsessed with this innovative product. However, unlike the youth in developed world, their counter parts in poor countries like India and Nepal cannot afford such higher price. So the latter may possibly commit some crime like burglary as a desperate way to make some money to own their dream product. But, if these high priced branded items are not easily available in this poor parts of the world, the young would go for some cheaper versions that suits their pocket. Probably you should use "such as" instead of "like" but the main issue that i can feel here is the overall idea is not convincing at all. You could say, for example, branded products negatively impact the local industry in developing countries or affect the overall financial status of individual etc. Will reading model answers help me get an IELTS band 7? I am looking through various examples of writing section. Does this help for my writing or do I need to practice the essays of task-1 and task-2, so that my sentence formation and grammar mistakes can be verified later? Which one is the best way for scoring band 7 and above in writing section, please suggest? Comments for Will reading model answers help me get an IELTS band 7? Reading sample essays and graphs will help you as you will start to get an idea of what kind of topics come up (for essays you should then read further around those topics to help you understand them better and generate ideas). Also, assuming you are reading essays and graphs that have some kind of advice on how good the answer is, it will help you to understand what you should / should not do and how to structure a good essay / graph. However, only reading samples will be ok for someone who is already a very good writer with good grammar etc. but if you are not, then of course you will also need to work on improving your lexis, collocations, grammatical range and accuracy etc. If you don't do this then you may end up writing a good essay or graph in terms of its organization and content but end up with a poor score for the other criteria. So yes, most people will probably need to do both - read samples and also practice (and if possible get feedback). A lot of people don't get a band 7 because they cannot get a majority of sentences error free (which is required for a 7 for grammar), so this is another reason why you need to practice your writing and grammar if you want a 7. Take a look at this lesson on How to score an IELTS Band 7 for more information about grading criteria etc. Best answer of those who scored Band -7. They are very useful and help a lot to the Students who are preparing for the IELTS Exam. I GAVE ielts exam 4 times. Listening always got 6.5, 2 times got 7 and 2 times 6 in writing, 3 times 6 and 1 time 7.5 in speaking and 2 times 6 times and 2 times 5.5 in reading. But my expectation is 7 in each band for immigration. Those who want to get 7 on writing. I need 7 in all four categories so I retook the exam with some practice in writing...guess what it was still 6.5. After that I retook the test 3 more times till I finally got 7.5 on writing. Here's my advice: don't try to be a writer just be a test taker. What I mean is this is not submitting a article for New York times. Don't try to write a masterpiece, just stick to the rule. You should make a formula for yourself after you read number of sample essays in IELTS buddy. Stick to this formula. You only give us some formulas buddy.. I am frustrated and demoralised. I was very good academically but now, I am stuck in this exam it makes me lose my self confidence. please help. Can anyone guide me on how to get an IELTS writing band 7? I applied for a remark immediately in writing as I needed a minimum of 7 and was only short by 0.5. After 6 weeks I got a response from IDP that my score remains unchanged! I am very puzzled as to where I may have gone wrong in the writing section. I tried my best to work according to the marking grid that the examiners use to assess our papers, though still fell short by 0.5. Reading from many of the experiences on this blog, I understand that people have had to appear for this exam several times before achieving their required scores. I have no option but to reappear but this time I have to get minimum of 7 in each section and 7.5 overall. I request those who have been successful in achieving such scores to please guide me, especially in WRITING section. Any books or online tutoring websites etc... Any help you provide would be very precious for me. Comments for Can anyone guide me on how to get an IELTS writing band 7? It was a disappointment for sure. Then I went for remark and now it's 4th week going on. I have no idea what would be the outcome. But if u want to know how I achieved 7 then I can help. I improved my writing within a month before my exam. I surfed constantly some useful websites named ielts-simon, ieltsliz, IELTS buddy and ielts-blog for the recent questions. I signed up for a website called www.grammarly.com within £20 and used to check regularly at least one task 1 and task 2. Though by the end of the month I wrote and checked around 20 task 1 and 10 task 2 only. But by that time I had figured out most of my grammatical errors. My basic problem was in grammar, punctuation. I believe here in uk examiners demand an error free essay. Whether u r indulging ur lot of ideas or not, that's not important but grammar should be ur first priority. Thanks for your comments on your own experience. It is often grammar issues that leave candidates stuck at 6.5. It is not necessary for an IELTS essay to be 'grammar free' to get a band 7. However, as it states in the band descriptors for marking, you do have to have "frequent error-free sentences" for a 7 for the grammatical range and accuracy criteria. You can check out and learn more about the grading criteria for getting an IELTS band 7 here. This means a majority of the sentences have to be error free, and this can be difficult to achieve. Of course you need to make sure you are doing what is required to meet the other three criteria in case you are making errors there too. I think it is possible to achieve expected score if your writing essay should be with sentence variation wittingly. for example, exam plenary punishment for environment pollution, success in cricket in Bangladesh has crossed the great milestone in recent time. Thank you brother to share your history for writhing how to obtain good mark in writing.I have still problem about my writing because I can't write because of the ideas as well as grammar. I want to improve my writing skills so I am looking forward to finding out a person wanting to take IELTS. My Facebook id is saifurshorker@yahoo.com. If someone wants to practice with me,you may send me friend request on Facebook. My Skype id is amal.ahmed697 please if you don't mind I need to ask you about your experience. Yes, because, I have to learn from someone so that, I know better, how to read and write perfect, I need to know something better. Have any of you tried praying? Whatever your religion may be...prayer is d master KEY! I never sat for any module of IELTS twice. &, pls it's not that am lucky...its because I prayed! &, prayers works well with faith too. I suggest that you guys give it a try sometime. Hello everybody!!! after 3-4 mount i am going to take ielts, thus i want to practice with native or english speakers. My login in vk.com Omar Zhadyra< please add me to your contact. Thank you for attention!!! How can I get a 7? Comments for How can I get a 7? you need to plus 1.5 (5.5 + 1.5 = 7). - Improve your grammar by practicing it everyday. Do some English tests and note some new sentence structure. - Improve vocabulary and skills to nail the listening and reading tests - those tests do not require perfect grammar to get a 9.0 and easily boost your overall band score. Well, I got 6 bands in speaking test last year on 21st may. Now i want 7 in speaking and my speaking exam is on 19th july next week. Please give me some tips to get 7 bands in speaking. Please give me some fruitful steps to get 7 bands. Mind blowing comments, before reading these, I was cursing myself for not getting required 7 bands in each module. Now realised many of my friends here are also struggling to achieve this losing hope. I have given it three times but am always getting 6.5 in writing, means no improvement. Indeed IELTS want me to write editorials or grammar books. - What happens when you again fail in IELTS? - How do people face their family after rewarding one more failure in IELTS? I took IELTS 4 times. Irrespective of so much hard work and high expenditure I couldn't get more than 6.5. To make matters worse, I got even 6 in writing on the last try. With all of these philosophies from every candidate around the world, it is firmly true that IELTS has become a business for them to reap of our pockets. Yeah I have to admit it. It is completely odd for a native student to take 7 for writing and for you to don't accomplish to get more than 6 even after 4 exams!! It is really strange!! Can anyone suggest how to improve my IELTS Score? I studied quite a lot, browsed nearly every useful Ielts websites including this website, studied from Barrons and Cambridge test books and even I went to an English language school in my hometown. Generally people advise to check the marking criteria first but I know them. I read quite a lot of band 8 and 9 essays. And because of that reason in my every attempt I was familiar with writing topics. I don't know from where to study and what to do. I simply lost my motivation. Can you suggest me anything? 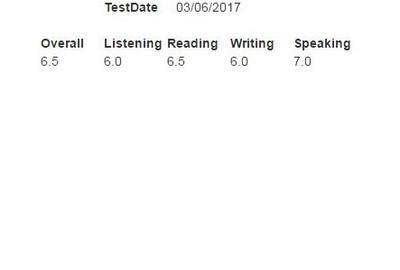 Comments for Can anyone suggest how to improve my IELTS Score? I believe the task where you can really improve is the listening part. If you make a lot of listening exercises, you can reach band 8.